The last total solar eclipse of the 20th century begins in the North Atlantic about 300 kilometers south of Nova Scotia where the Moon's umbral shadow first touches down on Earth at 09:30:57 UT. Along the sunrise terminator, the maximum duration is a mere 47 seconds as seen from the center of the narrow 49 kilometers wide path. No major landfall occurs for the first forty minutes as the shadow sweeps across the North Atlantic. The umbra finally reaches the Isles of Scilly off the southwestern coast of England at 10:10 UT (Figure 6). At this locale, it is already mid-morning with the Sun 45° above the eastern horizon. The center line duration is 2 minutes and the path width has expanded to 103 kilometers as the shadow pursues its eastern track with a ground velocity of 0.91 km/s. One minute later (10:11 UT), the umbra arrives along the shores of the Cornwall Peninsula. In the following four minutes, the shadow skirts the southern coast giving eager observers a brief taste of totality. Plymouth, the largest English city in the path, is north of center line and witnesses a total phase lasting 1 minute 39 seconds. London misses the total phase but experiences partiality with a maximum magnitude of 0.968. By 10:16 UT, the umbra leaves England as it quickly traverses the English Channel. 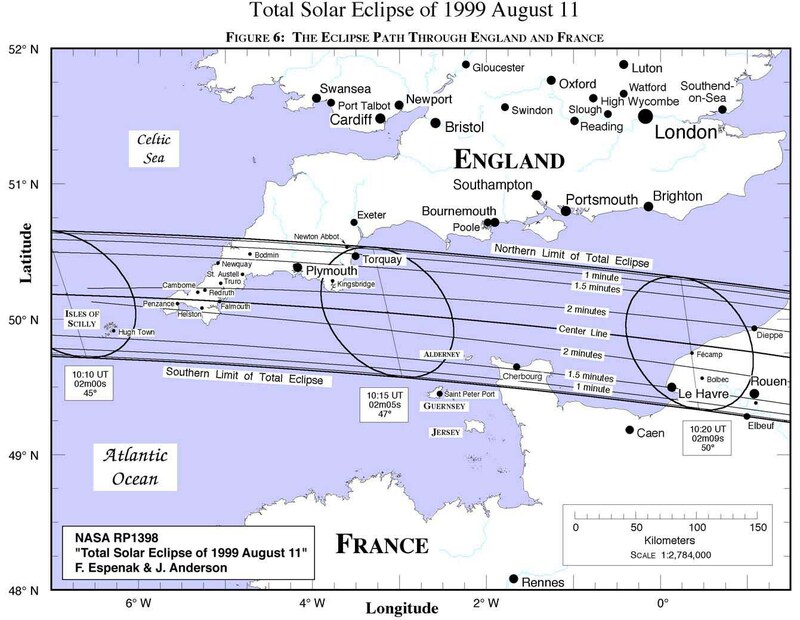 The Channel Islands of Guernsey and Jersey lie just south of the path and witness a partial eclipse of magnitude >0.995. To the north, Alderney is deep in the path and enjoys over one and a half minutes of totality. Not since 1961 has the Moon cast its dark shadow upon central Europe. The southern edge of the umbra first reaches the Normandy coast just as the northern edge leaves England (10:16 UT). But another four minutes elapse before the center line makes landfall in northern France (Figure 7). As the shadow sweeps through the French countryside, its southern edge passes 30 kilometers north of Paris. The City of Lights will bear witness to a partial event of magnitude 0.992 at 10:23 UT. Continuing on its eastward track, the path's northern limit crosses into southern Belgium, Luxembourg and Germany. Meanwhile, the center line cuts through Champagne where the citizens of Metz witness a total eclipse lasting 2 minutes 13 seconds (10:29 UT). Four minutes later, the entire umbra crosses into southern Germany (Figure 8) and the picturesque Rhine Valley. 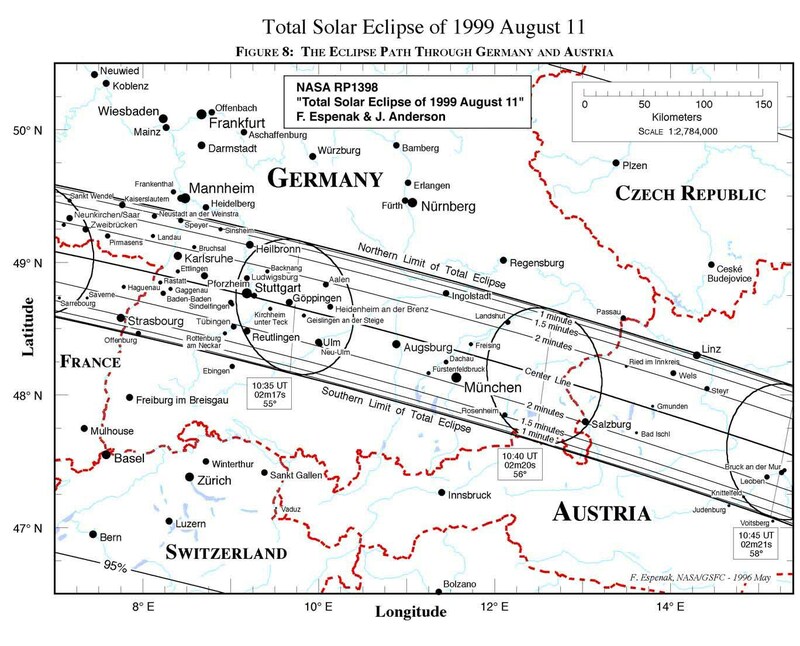 North of the path, Frankfurt witnesses a 0.979 magnitude partial eclipse, while Stuttgart lies near path center for 2 minutes 17 seconds of totality. At 10:35 UT, the Sun's altitude stands at 55°, the path width is 109 kilometers and the ground velocity is 0.74 km/s. Although München (Munich) lies 20 kilometers south of the center line, the city's two million citizens will still witness more than two minutes of totality, provided the winds of good fortune bring clear skies on eclipse day. At 10:41 UT, the umbra leaves Germany and crosses into Austria where it encounters the Eastern Alps. 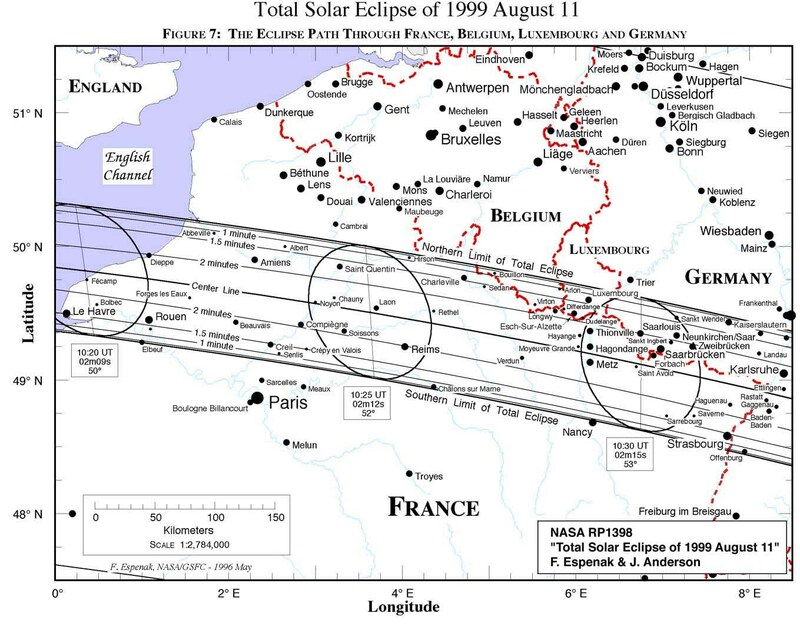 Wien (Vienna) is almost 40 kilometers north of the path and experiences a 0.990 magnitude partial eclipse. The southern edge of the path grazes northeastern Slovenia as the shadow enters Hungary at 10:47 UT (Figure 9). Lake Balaton lies wholly within the path where the central duration lasts 2 minutes 22 seconds (10:50 UT). 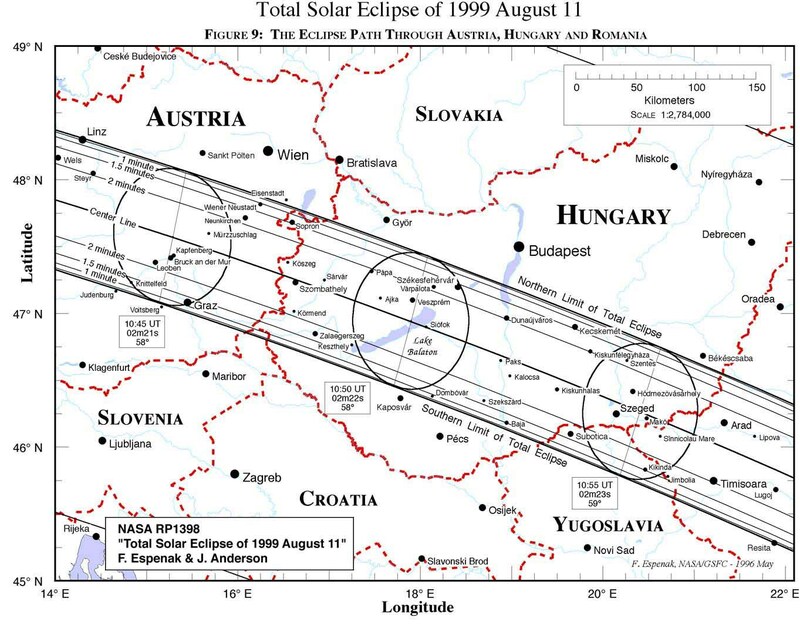 Like Wein, Budapest is also located about 40 kilometers north of the path where a 0.991 magnitude partial eclipse will occur. As the shadow leaves Hungary, the southern third briefly sweeps through northern Yugoslavia before continuing on into Romania. The instant of greatest eclipse1 occurs at 11:03:04 UT when the axis of the Moon's shadow passes closest to the center of Earth (gamma2 =0.506). At that moment, the shadow's epicenter is located among the rolling hills of south-central Romania very near Rîmnicu-Vîlcea (Figure 10). The length of totality reaches its maximum duration of 2 minutes 23 seconds, the Sun's altitude is 59°, the path width is 112 kilometers and the umbra's velocity is 0.680 km/s. Four minutes later (11:07 UT), Romania's capital city Bucuresti (Bucharest) is engulfed by the shadow. 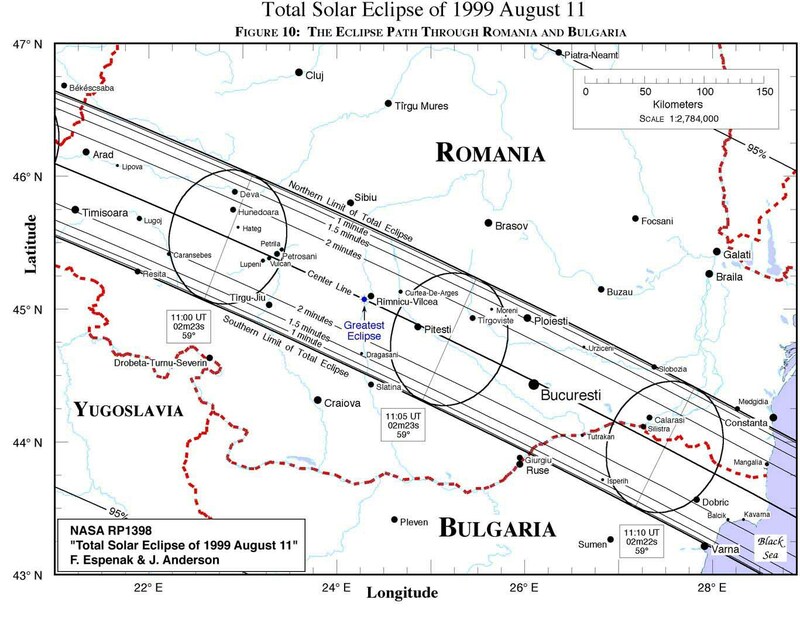 Since Bucharest lies on the center line near the instant of greatest eclipse, it enjoys a duration nearly as long at 2 minutes 22 seconds. Traveling south-southeast, the path encompasses the Romania-Bulgaria border before leaving land and heading out across the Black Sea. The next landfall occurs along the Black Sea coast of northern Turkey at 11:21 UT (Figure 11). 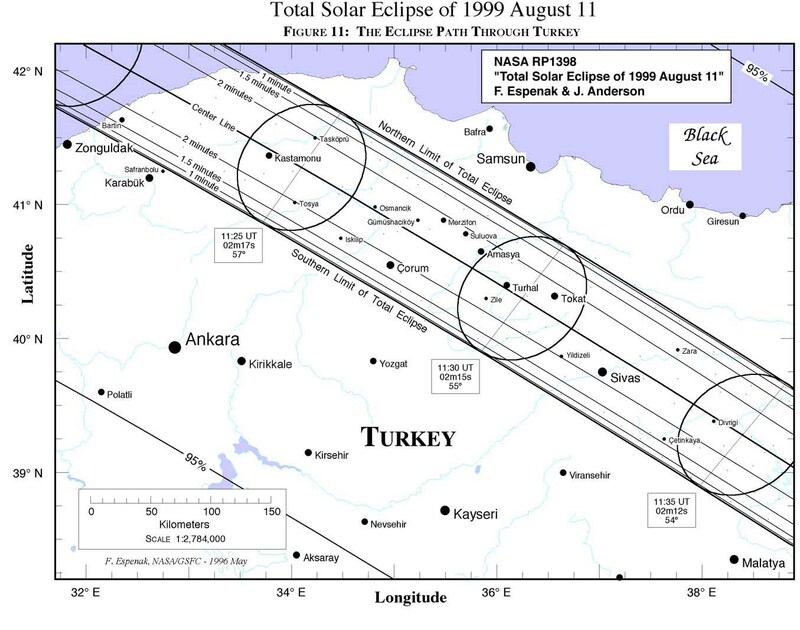 Ankara lies 150 kilometers south of the path and witnesses a 0.969 magnitude partial eclipse. The track diagonally bisects Turkey as it moves inland while the center line duration begins a gradual but steady decrease. At 11:29 UT, Turhal falls deep within the shadow for 2 minutes 15 seconds. The umbra reaches Turkey's southeastern border at 11:45 UT and briefly enters northwestern Syria as it crosses into Iraq (Figure 12). The center line duration is now 2 minutes 5 seconds with the Sun's altitude at 50°. 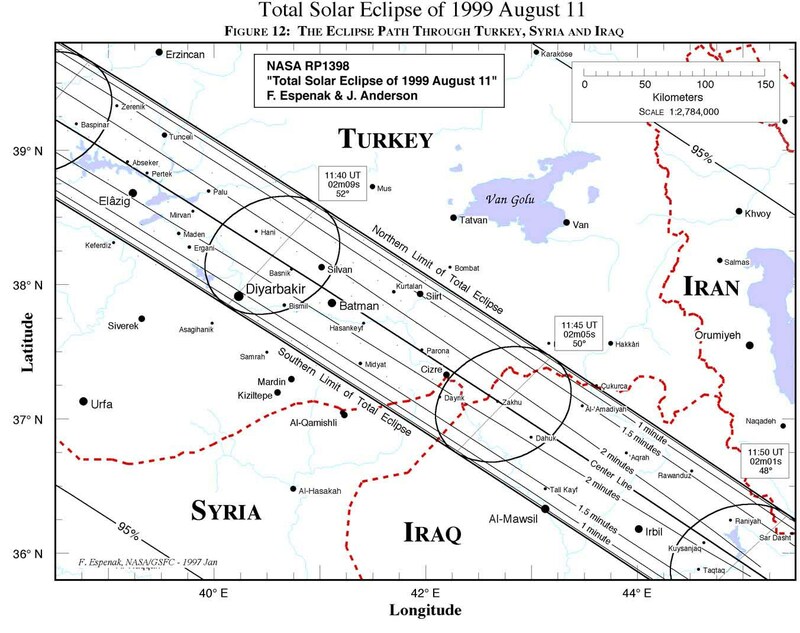 Baghdad lies 220 kilometers south of the path and experiences a 0.940 magnitude partial eclipse (Figure 13). Arriving at Iran's western boundary at 11:52 UT, the shadow spends the next half hour crossing sparsely populated mountain ranges and deserts (Figures 13, 14 and 15). Tehran lies north of the path where its eight million inhabitants witness a 0.943 magnitude partial eclipse. At 12:22 UT, the shadow enters Pakistan and skirts the shores of the Arabian Sea (Figure 16). Karachi is near the center line and experiences 1 minute 13 seconds of total eclipse with the Sun 22° above the western horizon. The path width has shrunk to 85 kilometers while the shadow's speed has increased to 2 km/s. The umbra arrives in India, the last nation in its path, at 12:28 UT (Figure 17). As the shadow sweeps across the sub-continent, its velocity rapidly increases while the center line duration drops below one minute and the Sun's altitude decreases to 7° (Figures 18 and 19). The eleven million inhabitants of Calcutta will witness a 0.879 magnitude partial eclipse with the Sun a scant 2° above the western horizon. Leaving India just north of Vishakhapatnam at 12:36 UT, the shadow sweeps into the Bay of Bengal where it departs Earth and races back into space (12:36:23 UT), not to return until the next millennium. Over the course of 3 hours and 7 minutes, the Moon's umbra travels along a path approximately 14000 kilometers long and covering 0.2% of Earth's surface area.